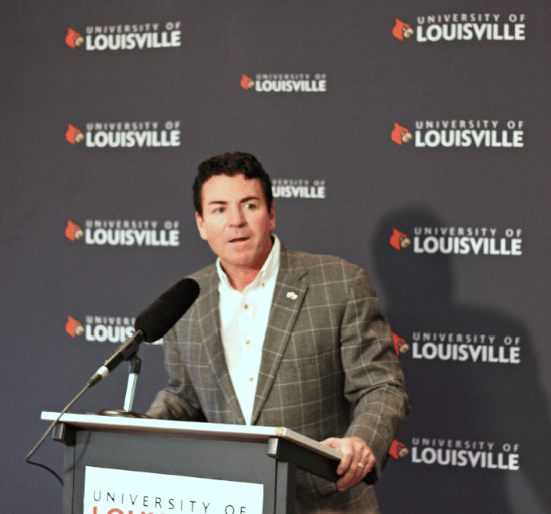 John Schnatter criticized university athletics Wednesday, saying athletics leadership was “invisible” and “sucking the lifeblood” of U of L.
Schnatter, a university trustee and Papa John’s CEO, asked trustees include athletics in financial discussions. Schnatter, also a U of L Athletics Association Board representative, said he and Interim President Greg Postel previously discussed athletics, saying there’s a pattern of its leadership being “invisible” to board discussions. “Until you fix athletics, you can’t fix this university,” Schnatter said. Board chair David Grissom told Schnatter they would discuss further during closed session, which Kentucky law mandates can only close when discussing hiring, firing or punishing employees. Board of trustees legal counsel Leslie Strohm said the board legally discussed athletics in closed session, implying they discussed hiring, firing or reprimanding athletics personnel. Postel later said Schnatter misquoted their conversation, but admitted they discussed the lack of athletics’ presence at board meetings. Senior Sports Information Director Kenny Klein said Athletic Director Tom Jurich will not comment on Schnatter’s remarks. Schnatter was vocal throughout the meeting, which was called to approve degree candidates, update trustees on the forensic financial audit and detail responses to next year’s $48 million budget deficit. U of L plans to increase enrollment by 8,000 eventually, monitor finances and tighten budgets. Postel suggested profiting through increased parking rates and outsourced parking, stating the university loses $2 million yearly from low parking rates and a new Health Sciences Campus parking garage. “Why would you want to make a profit on parking with students?” Schnatter asked, dismissing the loss. Postel said the parking rate increase would be modest for individual students, but clarified it’s a suggestion for the board to consider or dismiss. U of L profited from parking between 2013 and 2015, averaging nearly $3 million in revenue, according to budget reports. To further prepare for the budget deficit, Postel said a $25 million line of credit will likely be proposed in June. The line of credit essentially works like a credit card, allowing U of L to borrow money when it needs it. Reports from a forensic financial audit, investigating the university and the U of L Foundation, is expected to finish and be presented in June.